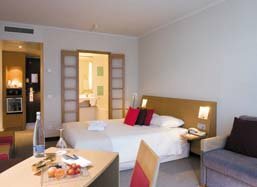 Rooms have wirless internet and satellite TV. The hotel is ideally located for flights from Newcastle International Airport, and the scheduled shuttle service can have you at the airport in 5 minutes. The hotel is a short drive from Newcastle city centre and the Metro shopping centre. The hotel has an indoor heated pool as well as fitness centre and sauna. Rooms have wirless internet and satellite TV. A spacious room with King bed, en suite bath or shower, sofa bed, work area, TV with pay movies and internet access, broadband connection, hair dryer, safe and tea/coffee. Up to 2 adults and 2 children. The hotel has an indoor heated pool as well as fitness centre and sauna. Just one of the many Hotels near Newcastle Airport available from FHR. Travelling north or south on the A1, exit at the junction marked Jedburgh (A696) and Newcastle Airport. Take the exit on the large roundabout marked Kingston Park. Travelling down to the smaller roundabout make a U turn towards the Novotel entrance (signposted on the left hand side). View all Newcastle Airport Hotel options available from FHR.